The journey to becoming my own boss is a very long one. As I prepare to launch "Your Numbers Guy" it's a perfect opportunity for me to reflect back on what brought me here and the decision to become my own boss.. Ever since my high school days I had a passion for business, especially numbers, focusing on skills such as accounting, marketing, and other business courses which finally lead me to the CMA (Certified Management Accountant) program and that has taken me on a terrific career ride over the last 3+ decades. Once I moved back to Mississauga, I was able to branch off into Supply Chain & Process Improvement including Operations. During my times as Controller and subsequent positions I learned a ton of business skills setting up a solid foundation of experience and knowledge and, although unknown at the time, these would prove instrumental for becoming my own boss today. 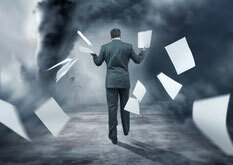 I left Carrier on my own, for a great opportunity, but looking back now I see how I had grown weary of big corporate thought processes and in the end it was a sign of wanting to be my own boss and shed the corporate bureaucracy. Joining a smaller company (Don Park) was a lot of fun and I got to dive more into the trenches and work with some great people. After 4 years the company was bought and I experienced my first "restructuring". I had a decent package and outplacement but had not been on the job hunt since early in my career. The job search world had changed significantly and it would be no picnic for me to find my way. But find my way I did even if I did it kicking and screaming with a host of low points! My outplacement was Right Management and it was here I learned how to better network, become a superstar on LinkedIn, branding, search strategies, and the like but was still focusing on the next T4 job. At the time it was what I thought was best and going into business for myself seemed like a lot of risk and too much work. So, I stayed the course which led me to a couple positions where I met up with the restructuring devil two more times. One of those even included the boss telling me you're doing a great job and a raise the month before the restructuring knive. Really? Enough already! The lesson I am referring too actually occurred between assignments where I met, and did some work for, entrepreneurs. I added value and expertise to their mix and provided a needed service which benefited both parties with flexibility, partnership, and quality services. They benefited by having access to my mix of experience and skills, without having to commit or hire full time, and I benefited by learning that small business and entrepreneurs are exciting partnerships to form. The real benefit for me is re-igniting my passion for business in helping people who run small business focus on what they do best and allowing me to assist, where required, on a number of business fronts. Last year, upon the advice of an entrepreneur, I incorporated Main Event Solutions Inc. using it for consulting. I had originally dreamed up that name for my hobby of photography and video production which I still do on the side. 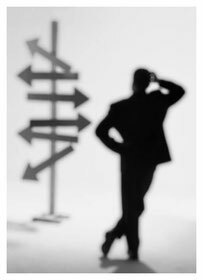 After a recent consulting contract with a large company ended early I decided that it was time to go back to my finance roots but within the entrepreneur and small business world. Even though the last gig was a contract it was ended early and just felt like another restructuring. With the consulting I was doing it was difficult to work with more than one client at a time. That made it like all the marbles were in one basket no different than being that T4 employee for a company. Lesson learned.....time to turn a page! Having access to a professional accountant, with years of business experience, for the day to day operations can be a costly idea at best. My goal is to provide the practical as well as expertise to small business that includes the numbers but also more at an affordable cost. In this blog I spoke about my journey to becoming my own boss and in the next blog will focus on some great reasons why it's a good idea. 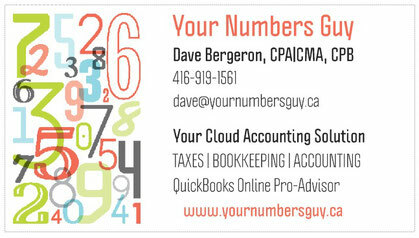 Thanks for reading and be sure to check out my web site at www.yournumbersguy.ca. Pass this on and share.